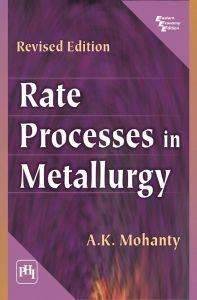 Primarily intended for the undergraduate students of metallurgical engineering, this book provides a firm foundation for the study of the fundamental principles of transport processes and kinetics of the chemical reactions that greatly help in carrying out a complete analysis of the rate processes in metallurgy. Systematically organized in eight chapters, the book provides a comprehensive treatment and balanced coverage of topics such as kinetic properties of fluids, heat transfer, mass transfer, techniques of dimensional analysis, treatment of transport problems by means of the boundary layer theory, reaction kinetics, and also makes a study of simultaneous transfer of heat, mass and momentum for various metallurgical phenomena. Every major concept introduced is worked out, through suitable solved examples, to a numerical conclusion. In addition, each chapter concludes with a wide variety of review questions and problems to aid further understanding of the subject. A.K. MOHANTY (Ph.D.) is former Principal, National Institute of Technology, Rourkela. He has over 32 years of teaching experience in metallurgy. His areas of interest include physical chemistry of metal extraction and process metallurgy. Dr. Mohanty has also published several papers in reputed national and international journals.